These hotels have large rooms and a kid-friendly vibe. 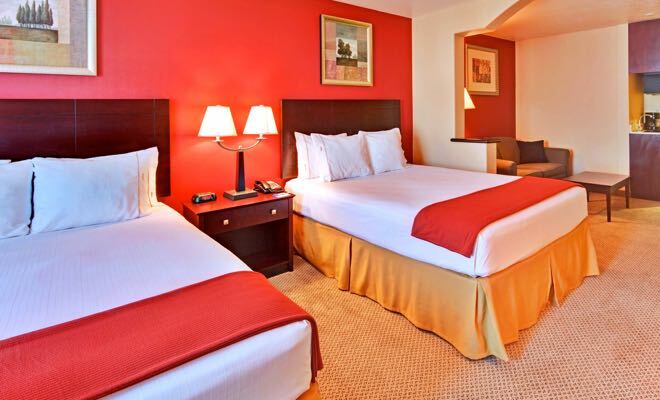 Two-bedroom suites sleep family of 5. Beautiful relaxing grounds & nice pool. Deluxe doubles are good for families. 2 bedroom suites have kitchenette and 2 queen and a sofa bed. Small indoor pool. Ocean view suites are large and have 1 king and 1 sofa bed – but no pool. Very close to Venice Beach boardwalk. Queen room with 2 queen beds. Outdoor pool. Short drive to Universal Studios. Family rooms have 2 king beds. Nice outdoor pool. 1 bedroom (king and sofa bed) and 2 bedroom (king, queen, and sofa bed) suites. Small outdoor pool. Some rooms have 6 single beds (and sleep family of 6), some have 8 single beds (and sleep 8). Rooftop pool. Double rooms with 3 double beds can (in theory) fit a family of 6. Are the VIP skip-the-line tickets for Universal Studios worth buying? Yes, definitely worth buying if they’re in your budget. There are two types of upgraded tickets available for Universal Studios – Front of the Line Tickets (you almost never wait in line for a ride) and the full VIP Experience (which has skip the line plus a behind the scenes tour and free breakfast and lunch). The best prices for tickets are usually found at the Getyourguide website. We are coming end of January 2018 to LA for a week, we have been before, but this time we are coming with our 2 year old son, visiting from the UK. We have no idea where to stay, we want a nice level of luxury, but also a base that is good to travel to the tarpits, the beach, and Disney for one day. Help please!